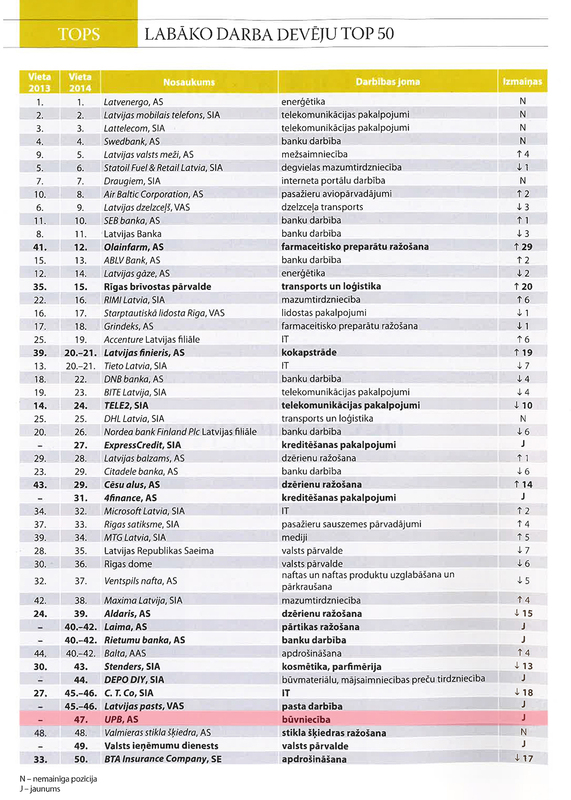 UPB has been listed among the TOP50 best employers in Latvia, ranking 47th, in a survey "TOP employer 2014" organised by "CV-Online Latvia". UPB is the only construction company on the list. The aim of the survey was identification and awarding of the best employers in Latvia, and it was run from 15.12.2014. until 22.01.2015., covering nearly 6500 respondents. The UPB holding currently employs slightly more than 1300 individuals working in modern offices and production plants equipped with the latest technologies and software. Each and every employee has access to career growth, along with full social guarantees, health insurance, and, if needed, 2 new multi-apartment boarding houses with 30 apartments for rent in the city of Liepaja. Employees of the holding are open and welcoming, and their skills ensure quality and new product development. Company experts are working with projects of European level, often exceeding even the level of engineering solutions offered by Swedish experts. UPB contributes to the growth of new experts through student placements, thus granting the valuable first career opportunities. In addition to that the employees can apply for the study grant from the corporate education fund „Stability“. However, most important is – UPB holding has a clear and stable future vision, and it has no intentions of stopping at what has been achieved neither now, nor in the future. The results of the survey "TOP employer 2014"